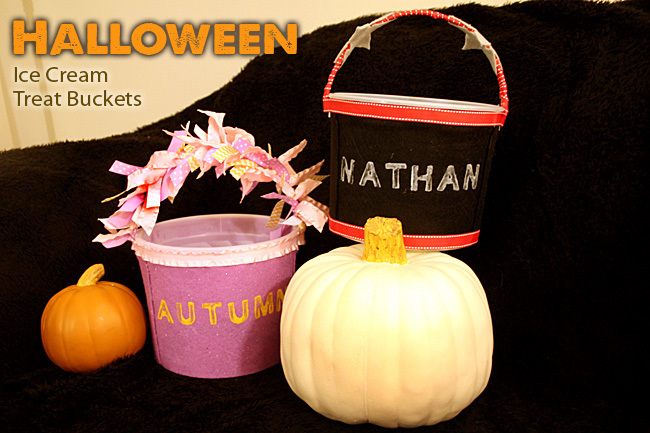 I am excited to finally share this craft with you and BEFORE Halloween! 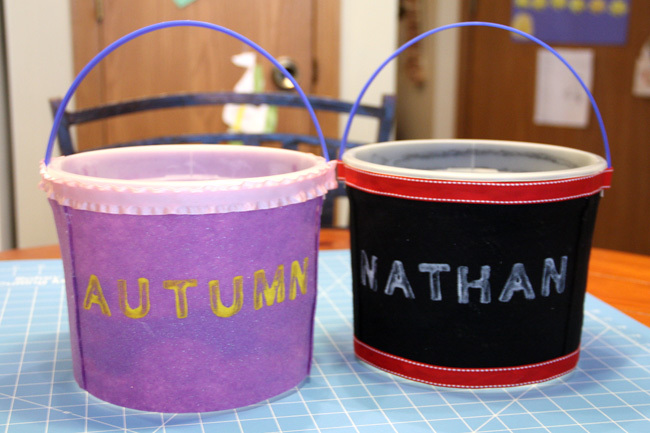 I have been working on it for a few weeks, it has just been so busy around here with all kinds of Fall activities, teacher conferences, dance watch classes, pumpkin this and pumpkin that… Anyway, last night I finally finished up the kids treat buckets!! I was looking forward to photographing them OUTSIDE after work… however, (a) It was almost dark by 5:30pm due to it being so overcast and (b) it was raining. Meh. SO, I set up a little spot in the house to photograph them and the lighting was horrible, so I set up yet another spot… and, I think the photos were successful for the minimal photography skills I have. Ha. 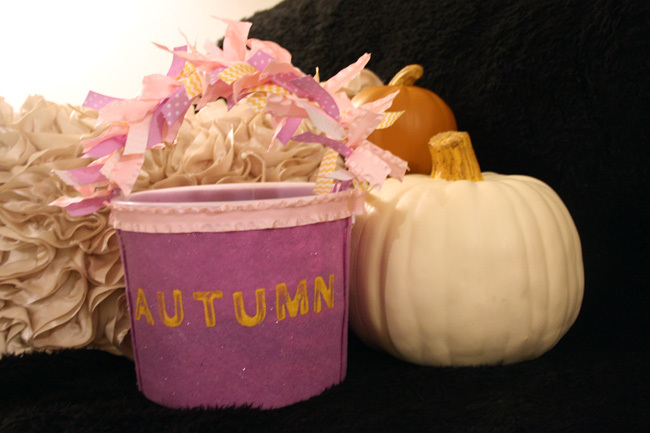 Here is how Miss Autumn’s Rapunzel ice cream bucket turned out. 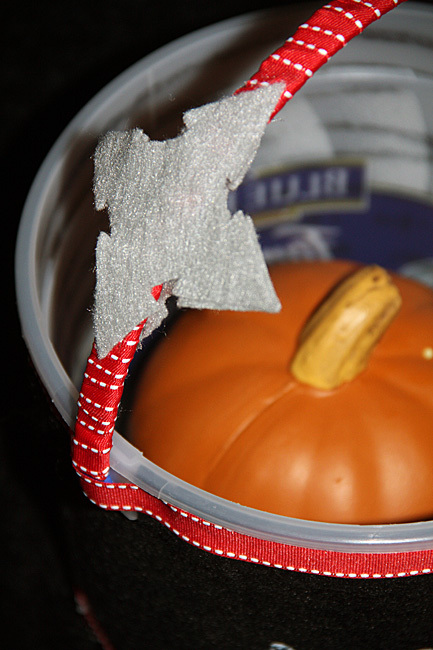 My absolute favorite part of this treat bucket is the ribbons on the handle. Oh my did I have fun selecting these pretties out in the ribbon aisle. The ribbon aisle in Hob Lobs makes me drool. 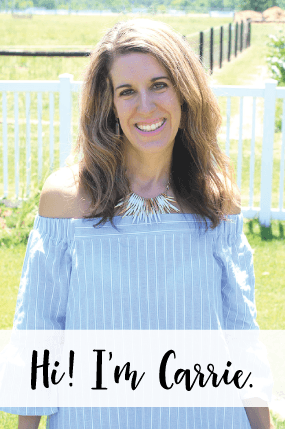 Ok, not really… but, I love me some ribbon. 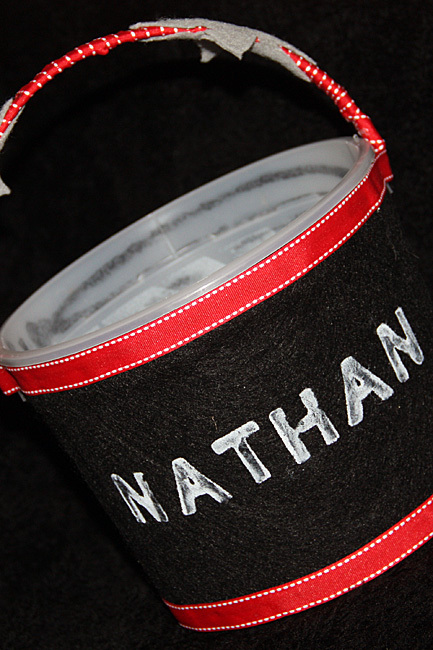 For Nathan’s pail, I just wrapped the ribbon tightly around the handle and then I glued some ninja shurikens onto the handle. Close up of the shurikens and ribbon wrapped handle. 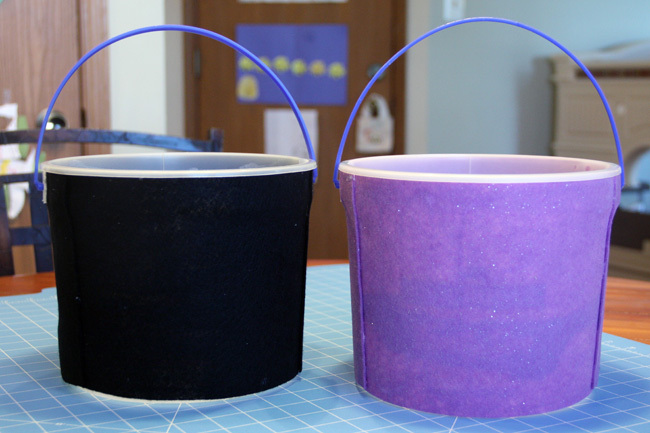 You don’t really need a lot of supplies to make these ice cream pail treat buckets… I purchased 2 pieces of felt for the color I wanted their bucket to be. If you have a girl, I highly recommend buying the ‘glittery’ felt, it is so cute. Since Autumn is Rapunzel and Nathan is a Ninja, I bought felt and ribbon in the color of their costumes. 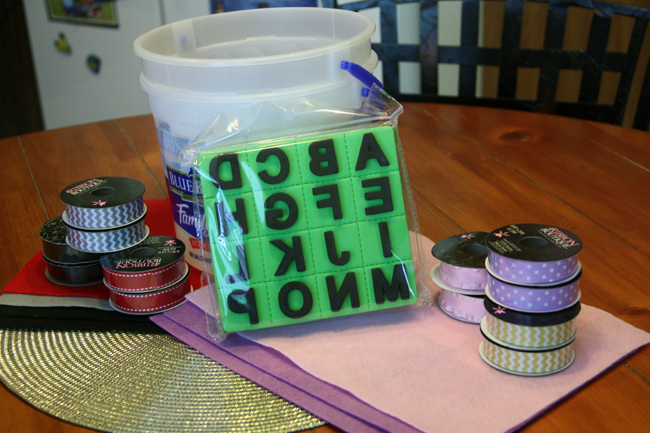 I bought 3 different colors of ribbon per pucket, 2 rolls of ribbon per color. You will also need to buy letter stampers and of course you’ll need to devour a pail or two of ice cream! ha! 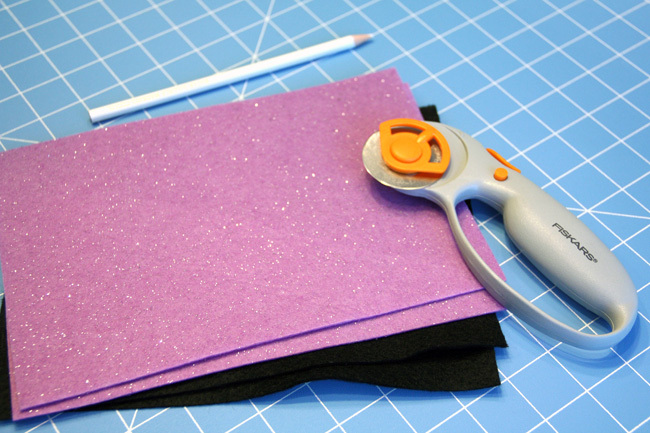 Measure and cut the felt down. 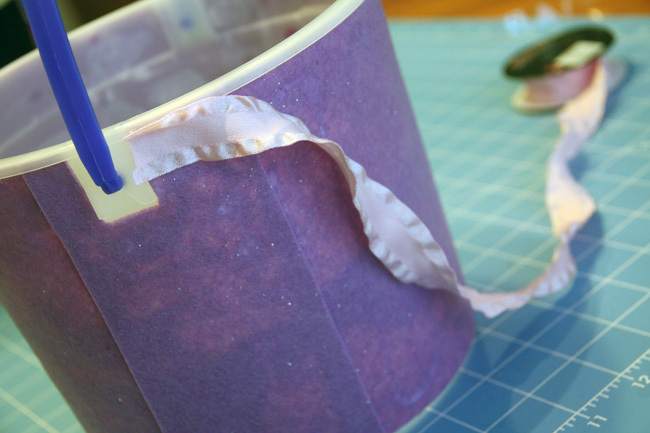 2 pieces of felt should cover one ice cream pail. To glue the felt on the bucket, I covered the felt with Elmers glue, then I hot glued the ends of the felt so it would stay adhered. 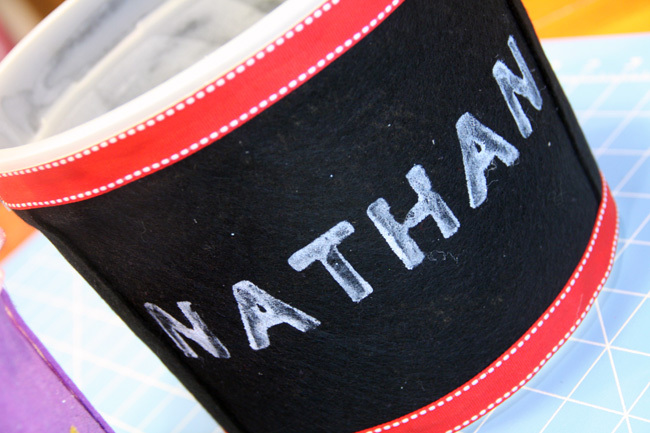 Then, I used white paint to stencil my son’s name on his bucket. 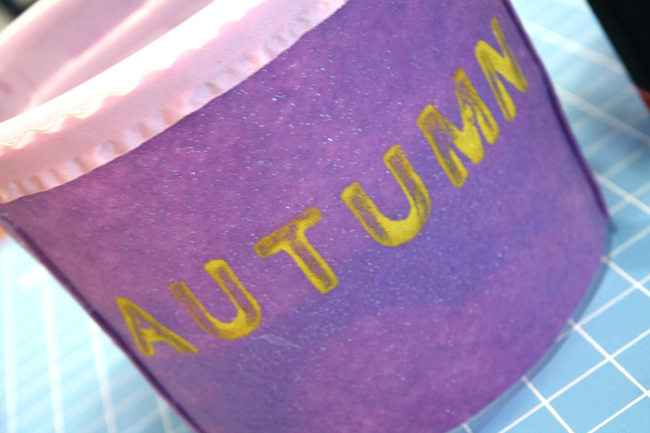 And, yellow paint to stencil my daughter’s name on her bucket. Now, I just need to decorate the handles! 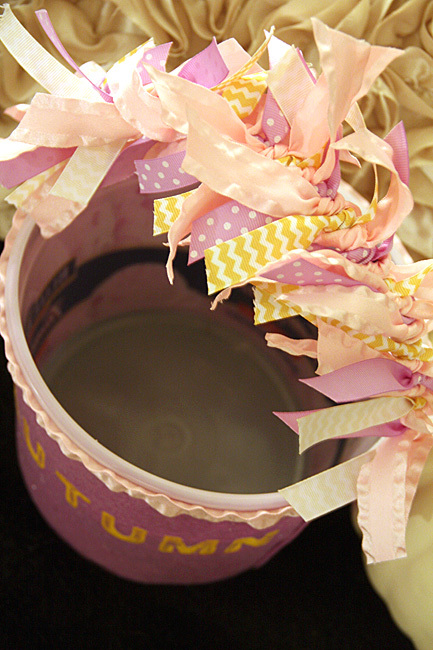 I decided to do this differently for each bucket. 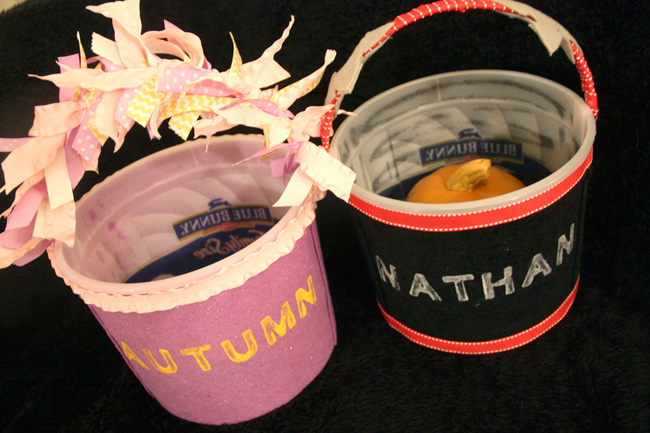 After you decorate the handles, you have two lovely ice cream buckets for your kids to trick or treat with! I plan to fill them with some candy and misc. goodies on Halloween for the kids to enjoy before trick or treating.